If the park gates are locked during open hours, call 311. On-site registration for Spring Activities begins at Upper Noe on March 7 at 10:00 a.m. For a compete catalog of all Rec & Park offerings, go to www.sfreconline.org. 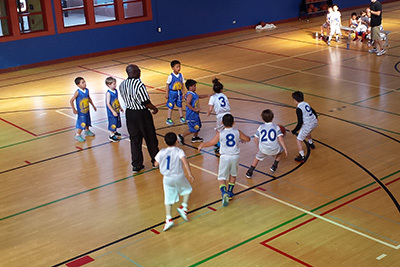 See the daily schedule of Upper Noe programs and registration info. Most classes at Upper Noe are open to drop-in guests for a small per-session fee. Check with Rec Center staff. *** Adult Cooking classes return to Upper Noe with Home Cooking 101 Wed 4/8 - 5/13, 6:30 -8 p.m.
Winter is basketball season and Upper Noe is teaming with players. From first and second grade basketball leagues, to pick up games during Open Gym hours, to shirts-and-skins games on the outside court, enthusiasts of all ages are coming out with Warriors fever to emulate Stephen Currie. Now there is a little something extra to help you through the week. 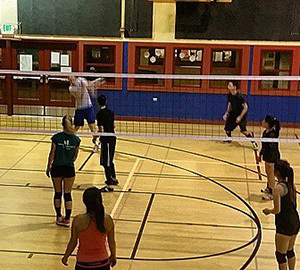 Wednesday Night Volleyball is now free. These games have been very popular. Full teams play with abandon until closing time. It joins this list of free activities at Upper Noe. All equipment is provided. 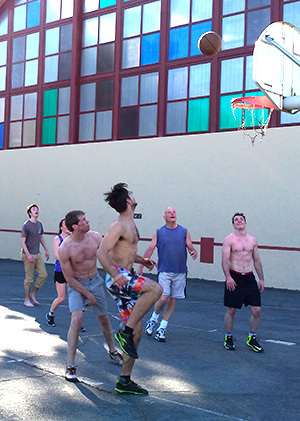 With a healthy budget this year, Rec & Park is looking for ways to offer more at Upper Noe. One proposal generated at the Upper Noe Community Recreation Council is to have the Rec Center open on Mondays. That would surely be a big hit with parents of toddlers. It might boost afternoon activities too. Friends of the NV Rec Center is trying to gauge interest in this proposal. Send input to info@noevalleyreccenter.com. If the community supports the idea, Rec & Park might find the support for it too. On Wednesday, February 4, the Upper Noe auditorium held its largest community meeting ever. 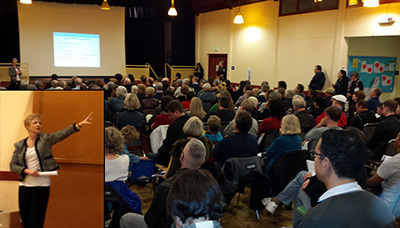 Over two-hundred neighbors packed the hall to hear spokesperson Kathie Studwell (inset, left) of the San Francisco Municipal Transportation Agency (SFMTA) Sustainable Streets Division explain the Residential Permit Parking (RPP) process and how it will affect our neighborhood. Friends of the NV Rec Center hosted this informational meeting after the community reacted negatively to a sudden proposal by a small group of neighbors to expand Glen Park’s Area D RPP zone all the way to, and including, 30th Street. While the SFMTA process for expanding a zone does not call for community meetings, only a gathering of signatures, it was clear from the turnout that neighbors felt a need to hear and be heard before committing one way or the other. Representatives presented for and against the proposal, and neighbors weighed in with one-minute comments. At least 70 people were still present when the meeting concluded two hours later. The proposal is a reaction to frustration over a perception that parking in our area is harder now than ever. According to SFMTA, the goal of the RPP program, which dates to 1976, is to "provide more parking spaces for residents by discouraging long-term parking by people who do not live in the area" by limiting non-permit holders to 2 or 4 hours between 8 a.m. and 6 p.m. on weekdays. Some residents see this as the solution to their parking problems. Some decry it as a costly and ineffective over-reaction. Others worry that it will adversely effect visitors, local teachers and other community workers, and exacerbate parking problems on the remaining streets outside of RPP zones. No consensus was taken. Whether SFMTA begins a study to expand Area D will be the result of signature campaigns for and against, block by block. Upper Noe is a beautiful park and neighbors love to stroll through as they traverse the neighborhood. While the $13M renovation of 2007-2008 overhauled the entire place, keeping it attractive has been a team effort. A lot of credit goes to local volunteers who pitch in to keep the gardens, courts and the dog park looking good. However, the heavy lifting is by dedicated Rec & Park staff doing the extraordinary. 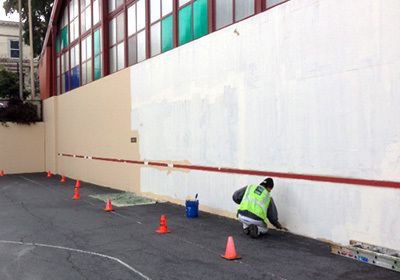 Recently, painters beautifully refurbished the bleachers at the ball field and completely refinished the heavily used exterior walls around the basketball court; they went the extra mile to chip away layers of loose paint and hand prime the surface so that it will withstand the punishment of high impact activities such as baseball pitching and tennis practice. Meanwhile, gardeners completely renovated the struggling garden in the northeast corner along Day Street. They pulled a huge weedy pampas grass, a herculean task in itself, along with unhealthy groundcover. 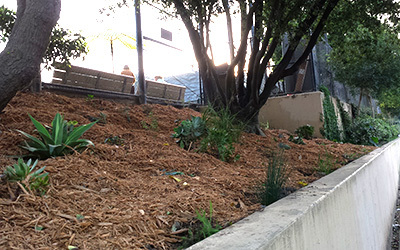 They then planted a mix of California natives and succulents in a bed of fresh bark mulch. In late March, other workers will undertake a project to refinish all of the interior wooden floors. The downside is that, for health reasons, the Rec Center must close completely from March 23 to April 4 until the vapors fully dissipate. The exterior will remain open and all scheduled activities there will proceed without interruption. 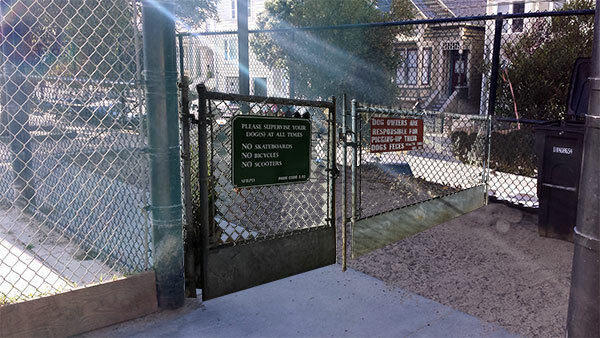 Friends of Upper Noe Dog Owners Group (FUNDOG) recently presented a proposal to Rec & Park to install a new gate in the middle of Joby’s Run. The purpose is to make the dog run safer and more usable by keeping pets in closer proximity to their guardians; currently, it is possible for pets to roam far and out of sight. Another benefit will be separated play spaces to allow uninterrupted games of fetch to proceed away from gallivanting groups of playful pups. See the full proposal at http://fundogsf.org/news.html. Scott Wiener and the SF Rec and Park Department will go over the recent conditions at the Upper Douglass Dog Park as well as providing maintenance and operations plans and potential improvements to the park in the future. Help keep Upper Noe beautiful. Bring a hat and gloves. February 28 from 11:00 a.m. to 5:00 p.m.
March 1 from 11:00 a.m. to 4:00 p.m.
GPNHP will have a table on both days.